There are plenty of insulation pipe wraps on the market today. They can easily be purchased online or in supply stores, come in different sizes and materials, and are fairly inexpensive. For these reasons, they’re great for homeowners who are looking to insulate their water pipes for energy savings. But in industrial mechanical applications, these kinds of DIY pipe wraps don’t work, and neither does trying to install mechanical insulation yourself. When you view these products online, the details are listed out for you to compare and find what you need. But often these products are not rated for industrial and mechanical applications. The R-value may be lower than what you would actually need and the life expectancy of the product itself may not end up being cost effective if you have to replace it a couple of years down the line. There’s also the matter of size; the pre-cut insulation available in retail stores might not be big enough for your industrial applications, leading you to get “creative” with sub-par materials. To complete DIY pipe insulation for a small house would take about 3 hours to complete. Now think about the mechanical systems throughout your entire facility. How long would that take to complete internally? Probably time that could be much better spent on other things. Professional installers have a defined process so that they can get your project done efficiently. A professional insulation installer can conduct an assessment of your specific environment and applications to determine the insulation material that will provide you with maximum benefits. If you’re trying to choose the right materials on your own, it can be challenging. There are so many products out there with different variables that it can be overwhelming. 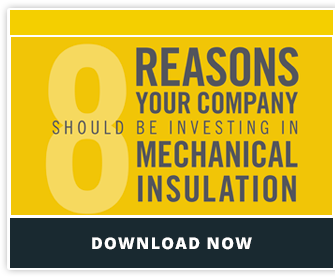 If you try to install mechanical insulation yourself, you may run into challenges you didn’t foresee. The result of that is that you either fit the insulation incorrectly, or you give up on it altogether and the tricky part goes uninsulated, costing you money and energy. Professional mechanical insulation installers have years of experience and training insulating even the most challenging projects. They measure, plan, and custom-fit each piece to provide maximum coverage. Doing it yourself might mean that you’re limited by the sizes and shapes that are widely available. As insulation professional and an energy advocate, I wouldn’t recommend trying to insulate your mechanical equipment on your own. The result will probably not create the energy savings you could be getting if you get a professional insulation energy appraisal and find out how much you could really be saving.